As many of my friends and family know, designing is a passion of mine. I love piecing together looks whether it be creating home decor solutions from items around your house or styling a look from the apparel and accessories in your closet. I am always up for the challenge because of my love for design! In fact, interior design was my major in college until I hit the point of burnout. It seemed that I was spending excessive nights in gluing balsa sticks together in an abstract form while all my friends were out having fun. I decided to explore my other passion: event planning. That led me to the Integrated Strategic Communications major with a focus on PR. Again, this major includes large attention to detail and many facets of design... right up my alley! While I did not complete an interior design degree due to my focus on public relations, I still thoroughly enjoy it. I was very honored when I was recently asked to assist Holly from Posy Floral Design with the redesign of her fireplace and mantle area. If you remember, I featured Holly's work in the Posy Floral Design post this past March. As a floral designer, she has produced arrangements for almost every bride I know... Yes, her work is that good. She sent me photos of her living room to give me insight to her country chic, laid back style. Her color scheme consists of brown, taupe, and teal. Side Note - The mantle items are in no particular arrangement at the time of this photo. This was simply for inventory purposes. 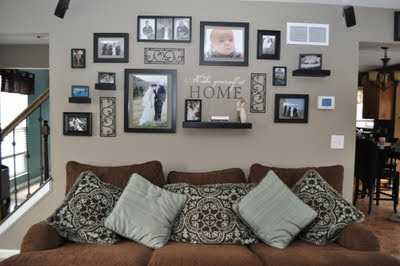 Another side note - I love utilizing items people already have in their home to style a space. As the home/space owner, it is such a good feeling knowing you can create a visual setup from things you already have laying around. "No purchase necessary" is a good thing. Holly had a wonderful collection of items so I knew she was beginning with a solid foundation and would not need to purchase much. After viewing the space, I felt having a strong focal point would anchor the room. My suggestion... a BIG mirror! I sent Holly several other ideas I have stored in my mental library from years of DIY and home decor blog stalking. I love books so I suggested stacking some large coffee table publications on the bottom ledge of the fireplace to make it homey. A couple weeks later, Holly revealed her new space. A mirror now creates a focal point. Her favorite books (including some from her Grandpa) now sit on the fireplace. She topped it off with greenery to add contrast. I love how these items came together. 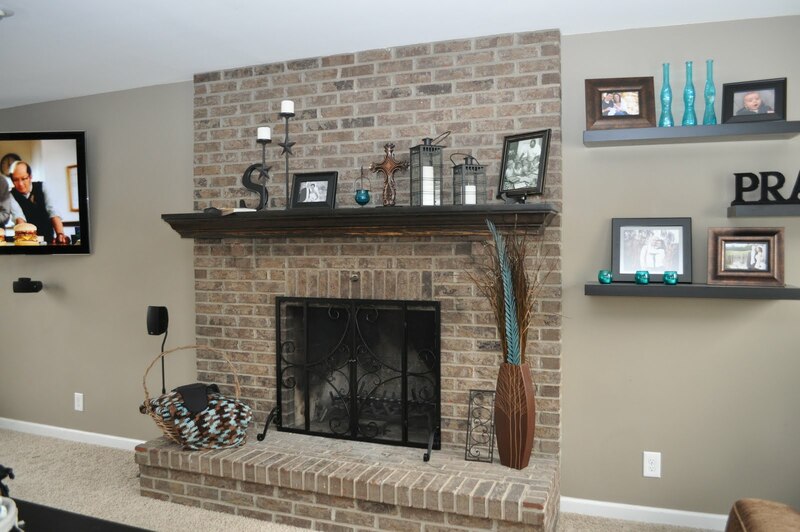 Holly did an amazing job arranging the items of varying heights so that the mantle feels balanced, but is not completely symmetrical. I especially swoon over those teal vases and the mason jar because they really pop. Now that you had a small taste, you must read the full narrative on Holly's living room transformation that is featured on her blog. Holly is truly a designer through and through. Not only does she continuously create gorgeous bouquets as the owner of Posy Floral Design, but she also has a knack for interior design. Interested in learning more about Posy Floral Design? Visit her blog by clicking here. You can also visit the Simply Sarah Style spotlight on Holly to check my favorite Posy bouquets and weddings.